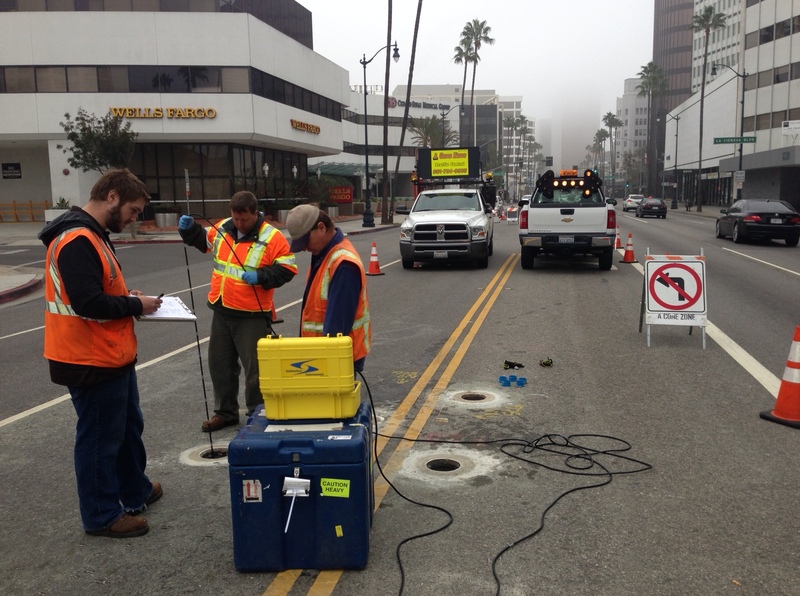 As part of the prep work for building the first phase of the Purple Line Extension, Metro contractors began exploratory work last week looking for tiebacks under Wilshire Boulevard in Beverly Hills. Tiebacks are underground anchors that help support buildings and other structures. (Here’s the work notice). The photo above was taken Sunday in Beverly Hills near Wilshire and Le Doux Road — one block west of La Cienega. Utility relocation work is underway at the site of the future La Brea Station and is expected to begin in 2014 at the Fairfax station area. You can find copies of work notices on the project web site (metro.net/purplelineext). Click on the “Field Work” tab. The first phase of the subway project will extend the Purple Line for 3.9 miles from Wilshire/Western to Wilshire/La Cienega. It is forecast to open in 2023. Reminder: There is a Section I Advisory Group Meeting tomorrow at 5:30 p.m. at the Petersen Automotive Museum; project updates will be provided for area residents, business owners and anyone else who is interested! Details here. I wish this would have been done 20 years ago. Imagine how this will change the dynamics of our city. 2023 is not soon enough.